With the passage of a cold front early on the 5th July came some cold air and snowfalls. Within the embedded westerly airstream was a cold pool and a region of vorticity. Matthew Piper and I were available to target the passage of this system. Besides the snow showers during the afternoon, the majority of snow finally began dumping on Oberon during the evening. It was so heavy that the snow began to accumulate within 10 minutes. Given the fact we were expected to return home and wanted to avoid possible road closures, we lft by 5pm passing through the township. Apart from obvious snow near Mt Bindo, the rest of the trip to Mt Victoria was wet though mostly the remnants of cloud dissipating from the effects of the rain shadow on the eastern side of the Hampton range. Photographs will be posted shortly. Excellent! How much snow acumulated on the ground before you left? Tomorrow is looking very good as well as the upper trough passes over the ranges. It looks like snow to 10cm+ can be expected to accumulate by tomorrow night. I would say the first of the snow would start falling out there tonight. It is looking quite good for a few cm of snow on the Northern Tablelands this Sunday too. Will have to check the trajectory of the moisture and timing of the coldest air, but can be up there all day Sunday so will not matter too much - just so long as the cold air does get there. The next system coming through this weekend looks good, however the latest model runs would tend to indicate the best snowfalls will occur overnight tomorrow and through into Sunday morning. The center of the -30 degree 500hPa cold pool is predicted by LAPS to be positioned over the central west plains by 10am Sunday. I am glad I went yesterday given it was a daytime event and it snowed heavily for little while and near Oberon. The situation continues to look good for Northern Tablelands, Barrington Tops and Mt Kaputar snow with all of Sunday likely to see snow showers on high ground, but particularly during the afternoon and early evening when 850 temps are a bit lower. Moisture levels decrease during the later evening and I can't stay the night anyway as have work first thing Monday morning. Should be heading up there tomorrow morning. 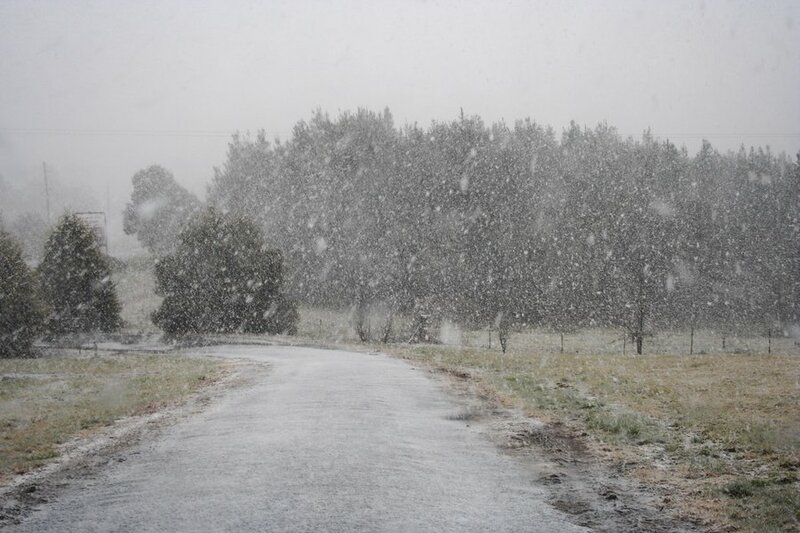 Just had a report from Chrissy and David that it is snowing lightly at Guyra right now (8am Sunday). Rod and I are heading up. Looks great on satpic and model output suggests a few cm is quite likely on higher ground in NE NSW. Had a call from Michael ! Currently, the sat pic looks great with more precip out west. All the models that i looked at this morning showed resonabe amounts of precip. So late afternoon and tonight should be interesting. * Inn Road Ben Lomond and south - snow showers it settled lightly and the sun came out so it went. * at the time of our conversation - Michael and Rodney were west of Llangothlin ( small village north of Guyra)around 1 - 2c heavy snow shower turned the hills white. Also Michael thought he heard thunder. Got a call from Michael (at 5pm) 4cm measured at Inn Road Ben Lomond. Inn Road is the road that leads to the village of Ben Lomond - elevation is 1370 - 1420 metres. Still is currently snowing at the time of our conservation. Rodney and I headed off from Lismore about 9.15am. It snowed at Glen Innes during our drive south, then a heavy 10 minute snow shower occurred just south of Ben Lomond from 1.15pm. Partly sunny conditions soon melted that cover. There following photos were taken in the Llangothlin area. There was heavy snow with large flakes from a line of wintry storms / large cumulus. We heard one thunder static on the AM radio. Cover was 3-4cm in places following this snowfall of about 30 mins. We met up with David and Chrissy from Brisbane, then drove to Ben Lomond. Another heavy snowfall occurred from 4.30 to 5pm. About 4cm of snow fell during that 30 mins. This pic taken along Inn Road. A b-double truck jack-knifed around 5pm on the Ben Lomond Range from what we could tell on the UHF scanner. The police closed the New England Highway between Guyra and Glencoe not long after that. We headed to Guyra for dinner and snow play. 4-5cm of dry powder snow here - awesome ! Rod and I managed to get around the road block by using dodgy (and very snowy) back roads but it added 30 mins to the trip. I think David and Chrissy had to go via Inverell to get around the accident for their drive back to Brisbane. The snowfalls were very extensive - all the terrain (between Black Mountain and Glencoe) above 1200m was completely white with at least 4 to 5cm of snow by early evening. Great to see good timing for snowfalls on the Northern Tablelands - it just continues to be an excellent season for snow excitement on the central and northern ranges. Here in Schofields - anvil crawler thunder was heard as steady rain was falling after the 8am measurement of 5.4mm. Dams in the area are filled to capacity - the soil that had begun to recover from saturation after a week of dryness will saturate once more. This is a stark contrast to the drought years when reports from several excavators we know suggesting that very rarely were they reaching the water table even at a depth of a few metres! I can see the Guyra snowfall at the Council was really nice and crisp. The best fall in Guyra this season. I calll this morning, the Black Mountain roadhouse around 8am and there was light snowfalls, but the highway was not closed. It was been a great season so far for sure for both the central and northern tablelands, and still is only early July. There have been reports all through June of light snow falling in Armidale, but yesterday was the first snow I've seen fall all season. We had scattered showers passing through all day until the afternoon, when the drizzle became more constant. the rain turned into rain showers, and sleet before five minutes of heavy snow (not as heavy as the snow shown in Jimmy's picture) it didn't settle and nor did it last. I wish we got heavy falls that actually settle more often. There are two problems preventing Armidale getting decent snowfalls more regularly: Its lower elevation compared to further north; and the topography is relatively flat compared to the main rise just north of the city. An orographic effect is often needed to produce snow on the Northern Tablelands so Mt Duval Nature Reserve and Black Mountain and downstream of the flow would pick up the best snowfalls - and of course the terrain is then largely 1300 and 1400 metres elevation. Orage - are you able to head north a bit during snow events ? Unfortunately, getting a snow level of about 1200-1300 metres is a lot more common than getting it down to 1000-1100 metres.